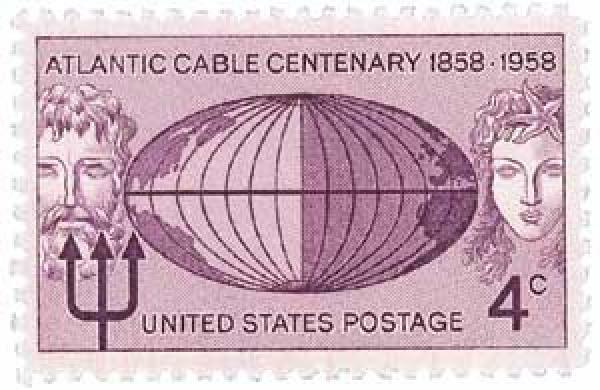 U.S. #1112 was issued for the 100th anniversary of the cable. 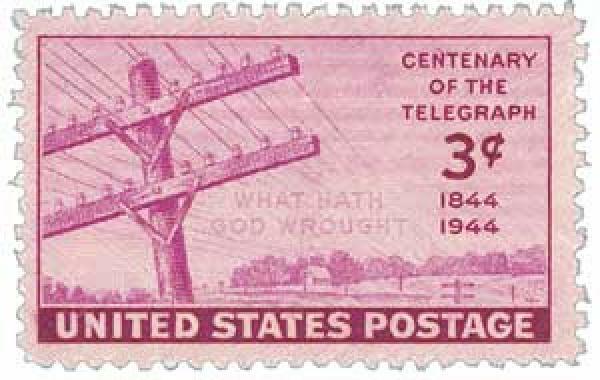 The telegraph soon became an important form of communication in the United States. Railroad companies used the telegraph to coordinate schedules and improve safety. By the 1850s, telegraph offices existed in every major city. Dreams of a cable connecting North America and Europe were born soon after the telegraph was made public. The first efforts at building an underwater telegraph were made to connect Nova Scotia to mainland Canada. The eastern Canadian islands turned out to be an ideal location as a connecting point to England. 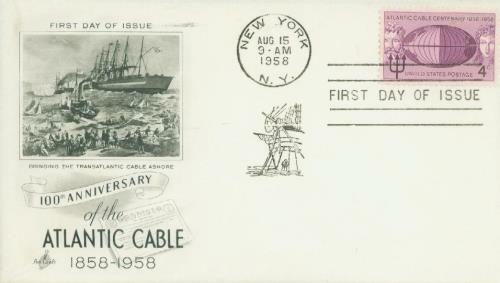 U.S. #1112 FDC – Atlantic Cable First Day Cover. By 1854, American Cyrus West Field was convinced that a telegraph could be laid across the Atlantic floor. Two years later he founded the Atlantic Telegraph Company and brought his idea to the American and British governments. After having failed once in 1855, in 1856, Field successfully laid a cable across the 68-mile Cabot Strait, connecting Newfoundland and Nova Scotia. With support from both nations, the first attempts to run a cable across the Atlantic were made in 1857. That summer, two ships, the H.M.S. Agamemnon and the U.S.S. Niagara, sailed from the beach near Ballycarbery Castle in County Kerry, Ireland. The cable broke on the first day, but was repaired. It broke again further out in the ocean, and the project was postponed until the following year. 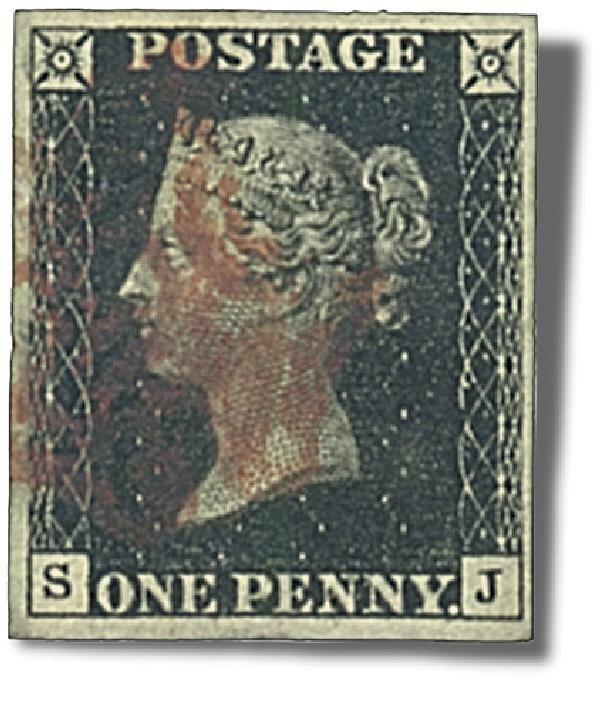 Item #BLACK1 – Queen Victoria on the Penny Black. In 1858, the two ships set out from opposite ends of the ocean with the plan to meet in the middle. More line breaks created difficulties, including one after the two ends were joined. By early August, repairs were made and the final lines were run. The cables were successfully laid by August 5. Over 2,130 miles of cable were laid across the Atlantic Ocean. The first message was transmitted days later, on August 16, 1858 between Ireland and Newfoundland. The first message took 17 hours to transmit. It said, “Europe and America are united by telegraphy. Glory to God in the highest; on earth, peace and good will towards men.” Then Queen Victoria and U.S. President James Buchanan exchanged congratulations. 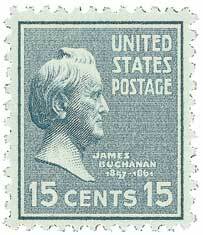 U.S. #820 – Buchanan stamp from the Presidential Series. The following day celebrations broke out. In New York City, there was a 100-gun grand salute, the streets were adorned with flags, church bells rang, and the city was lit up that night. Unfortunately, the electrical engineers operating the cable at either end had differing ideas on how it should be worked. The man on the eastern end believed they needed to use a higher voltage, which ultimately ruined the cable’s insulation and left it inoperable by early September. 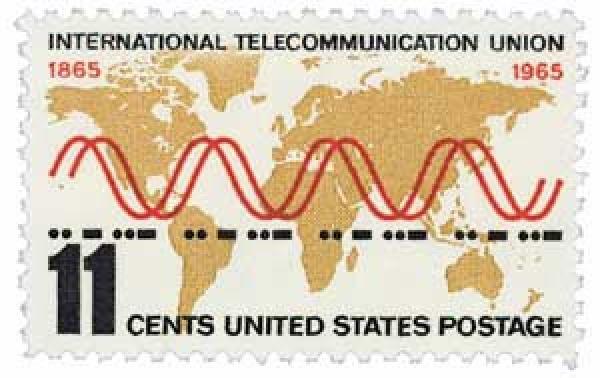 U.S. #1274 – The International Telecommunication Union was originally founded in 1865 as the International Telegraph Convention. Field was not deterred and hoped to renew the project, even though the public had largely lost confidence in it. In the coming years, other cables were laid in the Mediterranean and Red Sea, which led to better cable designs. By 1865, Field orchestrated the laying of a new transatlantic cable and within a year, its speed was vastly improved, able to transmit about eight words per minute. Click here to see a map of the 1858 cable route. This entry was posted in August 2016, This Day in History. Bookmark the permalink. 9 Responses to "This Day in History… August 16, 1858"
A great historical reminder of how things operated over 150 years ago. No electric lines, no telephones, certainly no computers, cell phones or all the other jingle-jangles of today. I did not realize that telegraph had such early beginnings. Just think that it took months to get a message across the Atlantic, now it was possible in a day or less. We used to say that if you wanted to get the word out, tell-a-phone, tell-a- graph, or tell-a-woman. Today it goes viral with email and facebook. Who would have thought. Thanks Mystic. Awesome information. I look forward everyday to read what happened in the history of our great nation. A resplendent remembrance of all the neat things we learned in Scouting. Nova Scotia is NOT an island. The provinces of Newfoundland-Labrador (Labrador is mainland) and Prince Edward Island are islands. But Nova Scotia is where myself and four or five generations of my ancestors have lived! You only enhance the reputation, that people in the United States have, of not knowing much about things that concern even near-by neighbours. Think that your fact checking needs some checking! This info has been corrected. Thanks. Oh No! On the contrary, thank you for the very quick response and correction. PBS produced a great documentary on this accomplishment. The cable that was laid in 1865 was used for 100 years.